A small, oval tree with bright green foliage. 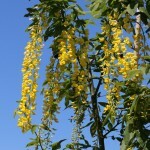 The fragrant, showy blooms are bright yellow and are borne on 10" long pendulous racemes in the spring. 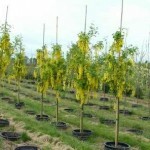 Prefers full sun to part shade in a rich, medium moisture, well-drained soil. Use as a small shade tree. It may be trained along an arbor or pergola.